Choose HorseHage for a Healthy Horse! The basis of any good feeding regime is excellent quality forage. Horses not only need the nutrients derived from forage, but also the digestion of forage produces heat, so it is a vital tool to keep them warm, particularly if they live out or are not rugged. 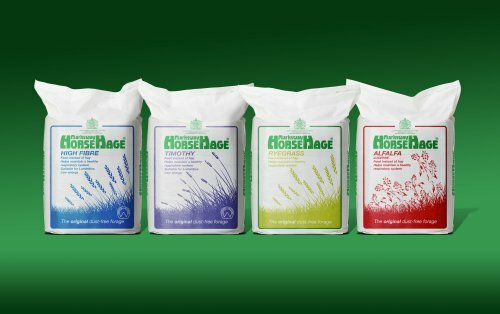 HorseHage is the ideal forage for all horses and ponies. It is consistent and reliable and contains just grass – naturally. When fed as the main forage source it can enable you to reduce your horse’s hard feed by up to a third. It is now available in four varieties – Ryegrass, High Fibre, Timothy and Alfalfa. Ryegrass HorseHage is higher in calories and is ideal for those horses that tend to lose weight over the winter months. High Fibre and Timothy HorseHage have an energy value similar to that of hay. Being lower in sugar than a typical hay sample, they both carry the Hoof Kind logo to show that they are safe to feed to laminitics and good doers. Alfalfa, which is used to make Alfalfa HorseHage, is a legume and has higher levels of protein, digestible fibre, energy, calcium and vitamins than grass. The protein content has the optimum balance of amino acids and lysine, which are especially important for growth, pregnancy and milk production. The higher nutrient levels make it suitable for horses in hard work, poor doers, veterans and show horses although advice should be sought from our helpline for further information before feeding Alfalfa HorseHage. HorseHage is packed into double-skinned bags to help reduce the risk of puncturing, and they are conveniently-sized for easy handling. For more information on feeding your horse or pony, please contact the HorseHage Helpline on 01803 527257. All my horses love the taste of HorseHage and eat every blade so there is no wastage and look great on it. I particularly like the size of the bales as they are so easy to move around and stack into the lorry when I go competing.